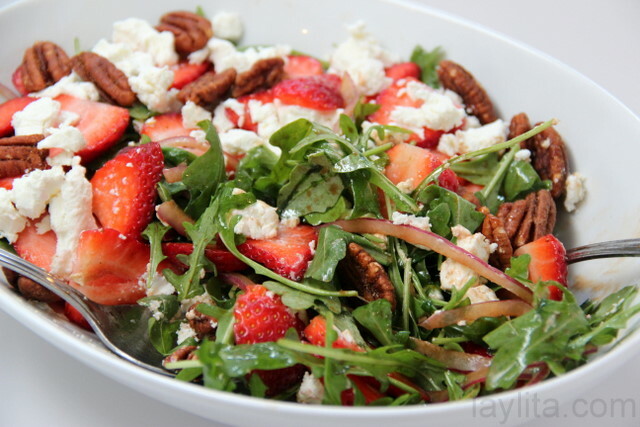 This strawberry goat cheese arugula salad is a one of those last minute salads I made using what I had on hand at the time: strawberries, goat cheese, arugula, red onions, spicy pecans, balsamic vinegar, and olive oil. 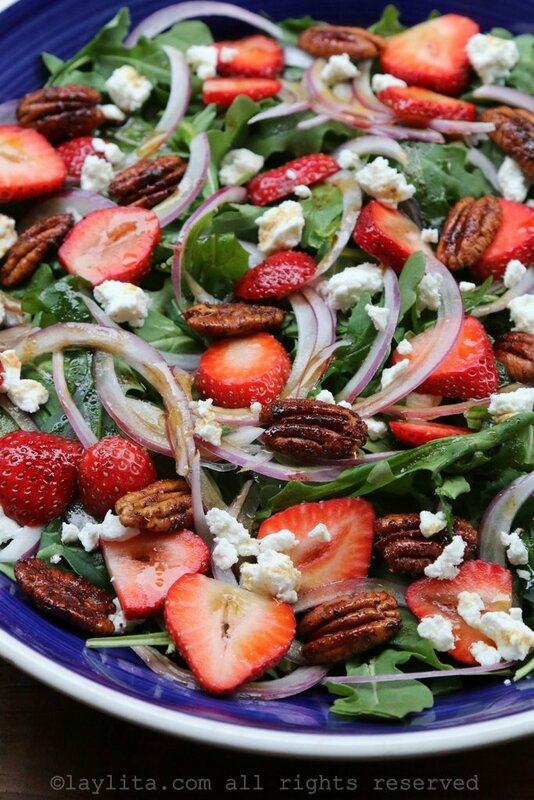 Salads are a must-have at lunch and dinner at our house, my kids know that there’s no question about this. We have our basic go-to salads that we always make: Nicolas tends to default to a basic salad with lettuce and tomatoes with a garlic mustard vinaigrette; while my classic salad is usually lettuce, tomatoes, onions and avocado with lime-cilantro dressing. Of course, the kids usually complain if we have the same salad every day so we have to change it up. 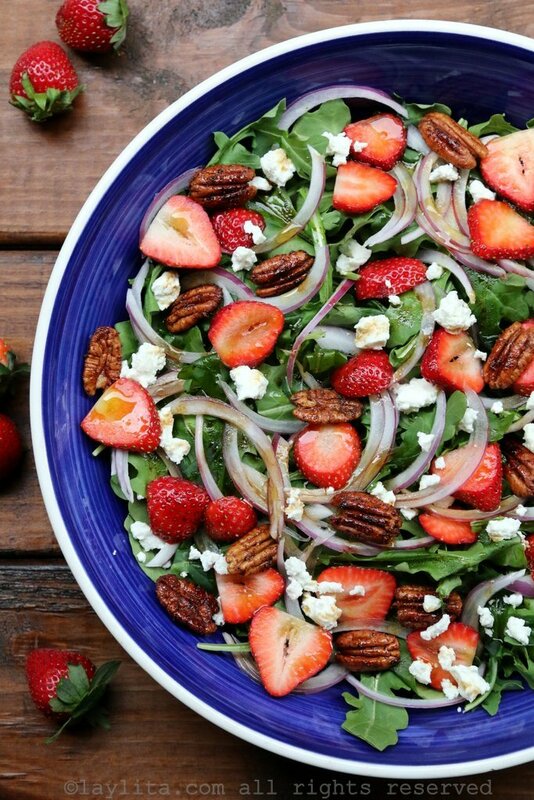 One of my favorite ways to mix it up when it comes to salads is to combine different flavors: sweet fruit, salty creamy cheese, crunchy nuts, crisp greens and a tangy dressing seem to work great together. 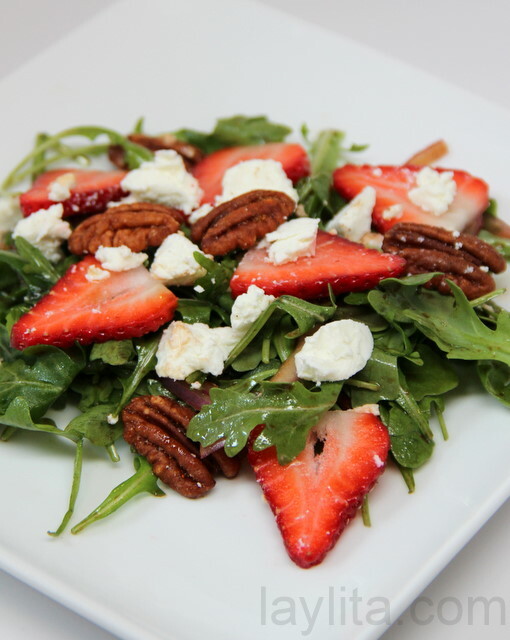 Quick and easy strawberry goat cheese arugula salad recipe made with strawberry slices, crumbled goat cheese, arugula, red onions, spicy pecans, balsamic vinegar and olive oil. 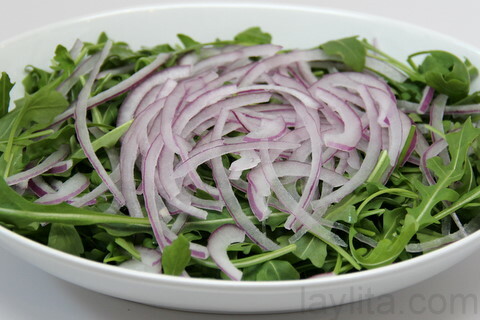 Soak the red onion slices in cold lightly salted water until ready to use – this will help remove the bitterness. Mix the balsamic vinegar with the olive oil and salt. 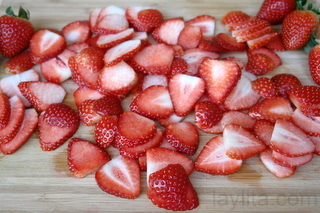 The easiest way to do this is to put them in an airtight container and shake them until the ingredients are blended. 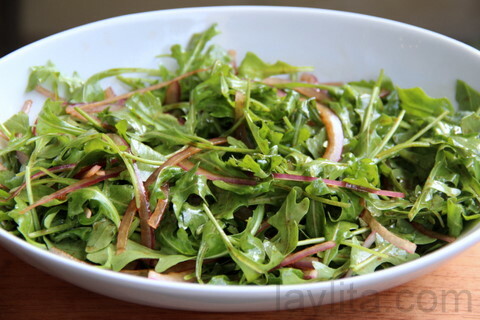 Strain the onions and mix them with the arugula and the balsamic olive oil dressing. 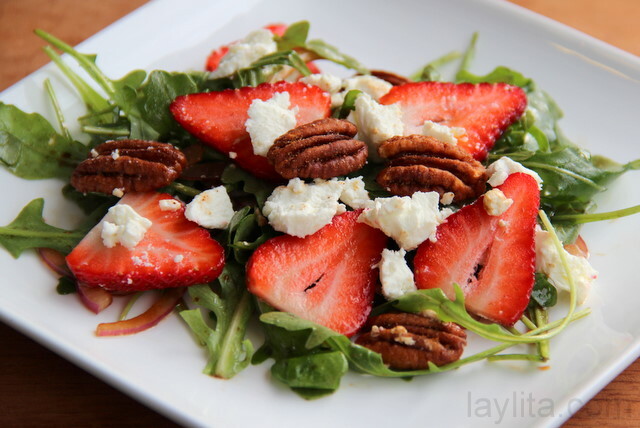 Layer the strawberry slices, goat cheese and spicy pecans on top. Toss table-side and serve immediately. 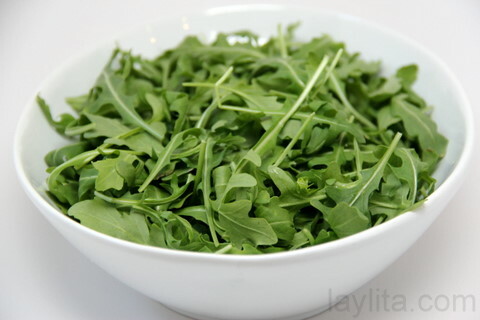 You can also replace the arugula with spinach or regular salad greens. You can use feta instead of the goat cheese. 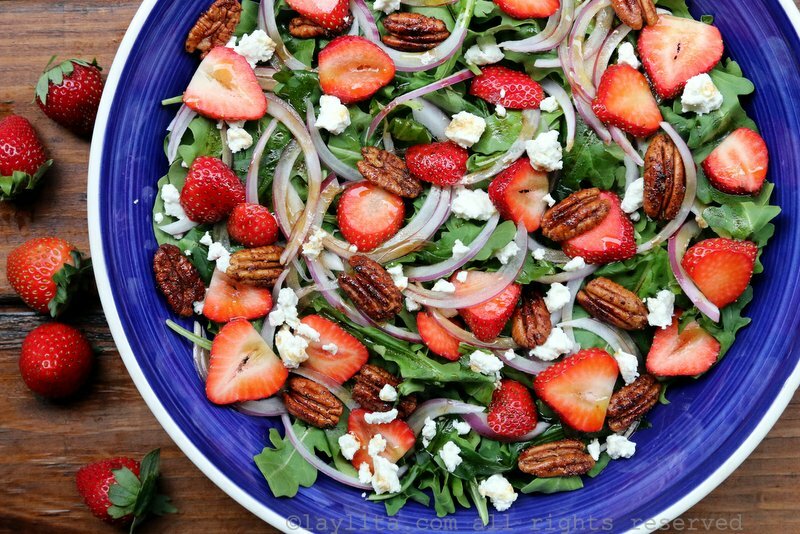 Strawberries and goat cheese are a great combination; add some refreshing arugula, spicy sweet pecans, balsamic vinegar, red onions and olive oil and you have an awesome salad. 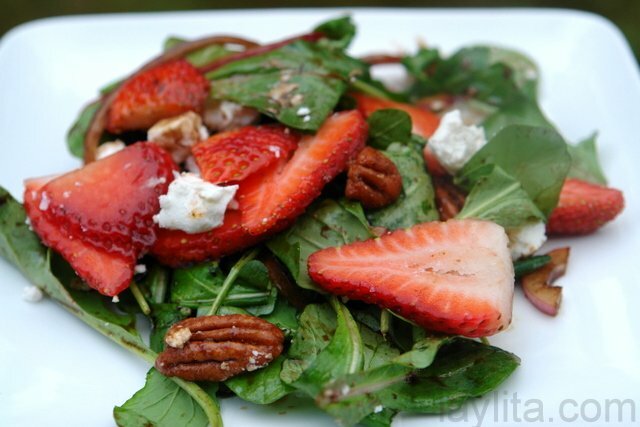 I made this salad for the first time a few years ago when I had some friends over for dinner. I was running late with the food (as usual, since I’m always way too ambitious with the number of dishes I attempt to make) and had to make a salad quickly. I probably had a different salad in mind, but at the moment simply pulled out a few items from the fridge, some store bought spicy sweet pecans and tossed them together with some balsamic vinegar and olive oil. 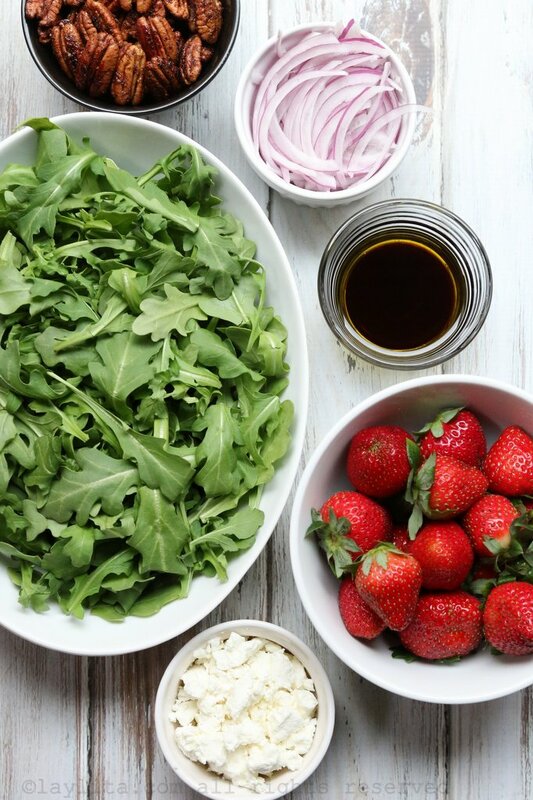 My guests loved the salad and since then it’s been a frequent repeat in our home. 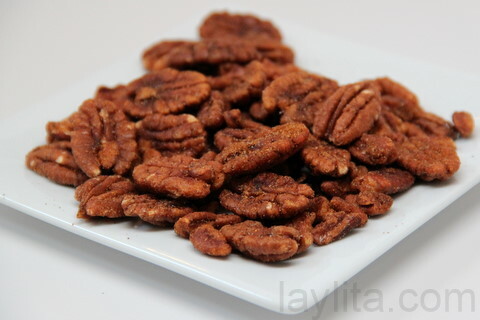 I used Trader Joe’s spicy sweet pecans (love Trader Joe’s – sorry for those that don’t have one nearby ), you can easily make you own by sautéing or baking pecans with butter/oil, sugar and chili pepper, let them cool down and you have a great snack or an addition to salads. 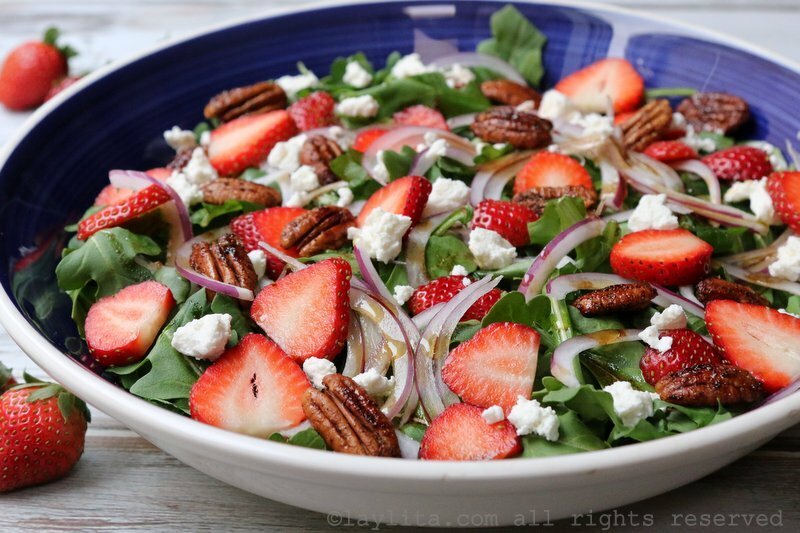 The great thing about this salad is that you can have all components ready: sliced strawberries, sliced onions, arugula, spicy nuts, goat cheese and balsamic olive oil dressing ready to go; then simply mix them together right before serving. 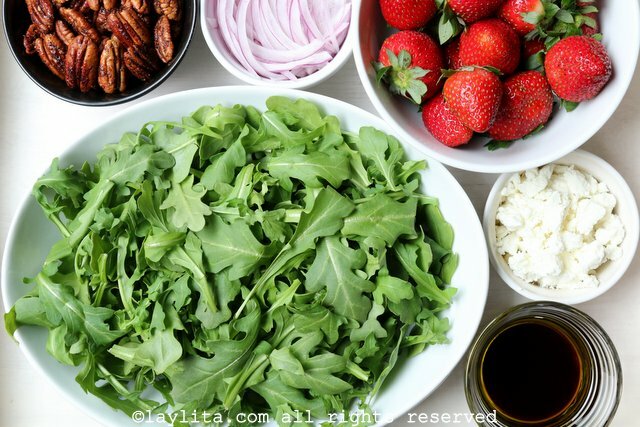 I like to mix the dressing with the arugula and onions first, top it with the remaining ingredients and then toss it table side. It adds a nice visual effect to have the contrast of green, red and white – and as we say in Spanish: la comida entra por los ojos, or you eat first with your eyes – it always helps builds expectations for a good meal. 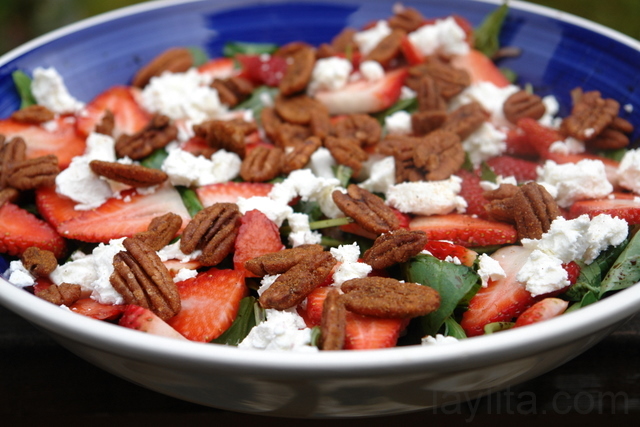 I have also made this salad with toasted pine nuts rather than pecans and it is delicious that way also. 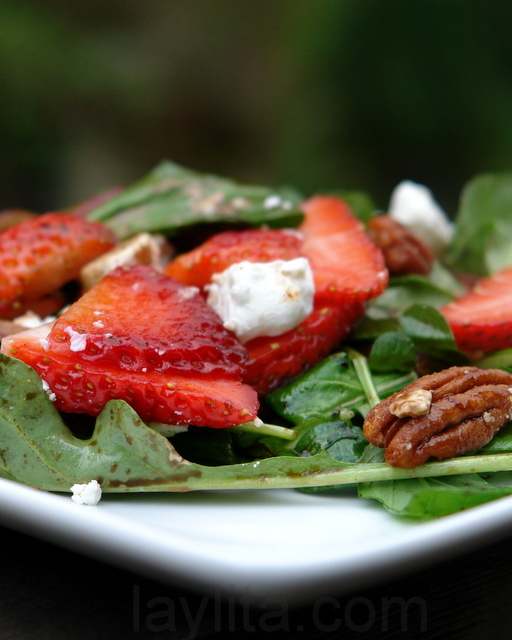 Made this salad, today, for lunch with the girls and it got rave reviews. So simple, yet full of flavor. I especially loved your tip for taking the bitterness out of the red onions – normally don’t care for them, but soaking them in water did wonders for them! Defintely plan to make this salad, again. 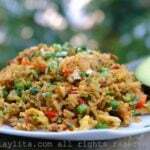 Thanks for another great recipe – keep them coming! Thank you for another amazing (and simple) recipe! 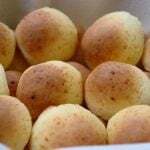 I love your website… it has taught me so much… I am a Brazilian girl married to an Ecuadorian guy, and he loves that now I can cook some of his favorite dishes.